Our babies are looked after by very caring and experienced staff in a calm and friendly environment. The rooms are bright and spacious and are equipped with a range of stimulating toys. Our babies also have easy access to a home corner and soft play area to help develop their physical skills and imagination. All toys are within easy reach so babies can have some free choice during their play. There are lots of opportunities for creative play such as sand, water, paint, play dough as well as a quiet comfy area with lots of books and soft toys. Attentive care and nurturing is vital at this young age of course, but babies also benefit from engagement with adults, other children and the physical environment. Our baby rooms have cots in a shaded side so babies can sleep while others can continue to play with carefully selected resources on the other side of the room. We offer a weaning menu for babies alongside our normal menu. Our babies are changed regularly using nursery provided recyclable nappies which are professionally laundered off-site. The Teenie environment is stimulating and exciting and is set up to enable free flow play and child accessible toys to increase independence and boost confidence, as well as carefully thought out and engaging staff led activities to enable children to learn valuable skills for lifelong learning. Within the room Teenies have the opportunity to play in the home corner, look at books in the cosy area, and play with sand, water, construction and exploratory toys. We have a ‘messy room’ where children can explore creative activities and tactile experiences. Throughout the day we set up group activities which help to develop social skills and interaction. We have plenty of displays around the room that all the children take part in to give them a sense of achievement and ownership. The majority of Teenies will have a sleep after lunch time and we are also happy to support individual routines with sleeps at different times of the day. Teenies also use our washable, recyclable nappies which are professionally laundered off-site. Our toddler room is specifically designed with 2 -3 year olds in mind and offers a wide range of equipment and activities to stimulate intellectually, physically, emotionally and socially; encouraging learning through play. Like all of our rooms it is spacious and has large windows that let in plenty of natural light. Staff carefully set up the toddler room daily, making sure that there are plenty of activities on offer and space for children to move around the learning environment freely. The room has several different areas set up and planned for weekly, daily and sometimes hourly! 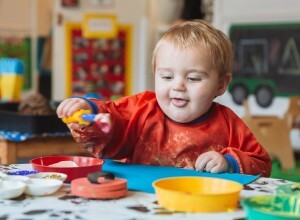 Toddlers enjoy playing with sand and water, joining in with creative activities and exploratory play and dressing up in both the home corners and role play areas. The staff carry out a circle time both morning and afternoon to promote social skills and use self-registration and special helpers to foster self-esteem and encourage empathy and helping skills. The majority of our resources are at the children’s level and clearly labelled with photographs and writing so children can access activities and toys independently. The toddler room routine allows plenty of choice and free play with activities encouraging children to learn through play. The toddlers also benefit from the use of a free flow garden giving them access to the outdoors all day. Nappies for children requiring them are provided using our washable and recyclable nappy system. Our pre-school room provides a learning environment where children are encouraged to be independent and to develop self confidence. The pre-school room has been thoughtfully planned to create ample space for our children whilst retaining the feel of a welcoming family home. Our pre-schoolers have access to a wide range of activities and resources which are divided into many different areas including role-play/mark making, book corner, listening corner, maths, ICT, construction, small world, creative, sensory/malleable, sand and water, as well as continuous access to our free flow garden. Our staff make sure there is a good balance of focused and more free play activities, providing preschoolers with the nurturing and attention they require to explore their developing capabilities. We celebrate positive behaviour in the pre-school room by sharing experiences at circle times and through encouragement and discussion with the children. We believe that it is important for children to begin to empathise with others and gain an awareness of boundaries for behaviour within the setting and wider world. "All children are eager to learn, self assured in their play and confident." "The outcomes for children are excellent because of the exceptional care they receive." "Staff feel very secure, happy and settled within the nursery." "Staff pay very careful attention to the learning environment. They plan exciting and challenging activities that build on individual children’s interests and skills." "The majority of staff have worked at the nursery for many years, which provides comfort and familiarity for children." "Children and babies separate from their parents happily, settling quickly to activities." "Staff ensure all children form appropriate bonds and secure emotional attachments."